My intellect is getting a pretty robust workout these days, pressing some heavy reading about aesthetics, moral creativity (does that make anyone nervous? I’m loving it…), and the notion that surfaces may actually have substance. Just think, lots of people are designing things that are aimed straight at my amygdala, my pre-cognitive, emotional self, and someone is suggesting that’s not a bad thing at all? Questions abound these days, questions of artmaking, identity, human beings, creativity, moral responsibility, Christian experience, the will, theatre, the nature of a moment, and the Psalmist’s constant reminder that we are dust and grass. Mind-mapping the ideas, metaphors, frames of reference, orientations, and artworks that my students in January will encounter as we talk about The Arts and Culture: A Christian Aesthetic. This year, a new question is nagging at me, and you’d think it would have nagged at me a long time ago, given the title of the class. What is a christian aesthetic? The word aesthetics can be used in a number of ways. It can refer to the philosophical study of the arts, to the artistic sensibilities of an artist, group of people, or a culture, or to the physical properties of design that describe an object. Questions of philosophical aesthetics deal with universal characteristics of art (if there are any), what distinguishes art from non-art, the various relationships between subject and object in art, the affective properties of various aesthetic elements (line, shape, form, color, etc. ), the critique and judgment of art pieces, as well as the impact of art and entertainment on behavior, morality, and ethics. So in raising the question of a christian aesthetic, I suppose I am referring to the various ways in which Christian art makers and audiences orient themselves toward the various sensual and spiritual (read “human”) aspects of the artistic/aesthetic work they make or encounter. Lady Gaga has an aesthetic. The Amish have an aesthetic. Goth Culture has an aesthetic, as does Hip-Hop. The Pre-Raphaelites had one, as did the painters in Northern Europe during the reformation. Rodin has an aesthetic. Pixar has one of the most successful and powerful aesthetics in the world. The War Games of Xbox and other game consoles have an easily recognizable aesthetic, as does anime. Family Bible Bookstores have an aesthetic that is pretty different than say, the bookstore set up by the Episcopal Church. What in the world would a Christian aesthetic be? Is there such a thing? Should there be? If aesthetics really means nothing more than style, then surely Christianity transcends style, and therefore we should be no attention to it at all, right? Why is it then that as many churches (probably more) split over aesthetic issues as do over theology and doctrine? I know of a church that is currently in the process of losing significant numbers of its members because the music style that had defined the church for nearly a decade was reportedly deemed by a pastor to be out of line with the direction of the church, meaning that the particular style of music was not going to appeal to the masses he was hoping the church would attract. Whether too highbrow or too lowbrow, what is this but a question of aesthetics, and a ready acknowledgment that aesthetics have real-time, street level power in the lives of regular folks like you and me? But from church to church, certain clothes are acceptable and others aren’t. Some tones of voice in prayer are more appealing than others, and the way the reading of scripture is handled says something of the culture of the church. Will it be a beautiful brass or silver that holds the blood of Christ, the rich headiness of wine suggesting the danger and pungency of his sacrifice, or will we throw back a shot of grape juice from small plastic throwaway cups? (Does my bias show?) Does it matter? Maybe not, but change the aesthetics in your church, and see how many people whisper in discontent and complaint, and see how many leave if you don’t change them back. I ask again, what is a Christian aesthetic? Help me out here. Give me a few thoughts on how you would define it. Better yet, maybe I’ll put out a request for tweets. I like that question. I would say the Christian aesthetic is gracious. That sounds kind of cliche but good art is gracious because it speaks to the great void and captures some of that mystery. I would also wager that the church in question is losing members not necessarily because of its music style changes, but because of the ungracious stance the leadership is taking towards the body. And in not having grace towards the body, they don’t have the capacity for grace in their art. …just my thoughts as I read your post. I love your starting point. Graciousness. It doesn’t sound cliche to me at all, but I do wonder what it means for a work of art to be gracious. What does it mean that art is “gracious” if it acknowledges the void and the mystery? I think I follow, but some clarification would be helpful. And as far as churches losing members because of a lack of graciousness, I’m sure you’re right. But at some point, I would argue that even graciousness does not make all aesthetic issues and differences go away. A gracious rejection of shared taste and style (whether it be clothes, baptismal liturgy, or musical worship) is still that…a rejection. And when aesthetic taste and preference is challenged as being “out of touch” or one that “doesn’t connect with young people”, say–or better yet, one that Jesus wouldn’t likely embrace…well, even in the most gracious of circumstances, such things are hard to take. What I’m exploring is the actual power and weight our particular aesthetic preferences have, and the substance we ascribe to them. Thanks for reading and replying. It’s nice to know folks are out there. First and foremost what matters most is God(Father, son and Holy Spirit). Applying that to aesthetics is my “Christian aesthetic”. But since God is the creator it could be said that everything is a “Christian aesthetic”, or Nothing or both. Jeff, Offhand I can think of nothing that would describe Christian aesthetics (I’m not sure I know the meaning of the word) better than Paul’s admonition to the Philippians: Finally, brethren, whatsoever things are true, whatsoever things are honest, whatsoever things are just, whatsoever things are pure, whatsoever things are lovely, whatsoever things are of good report; if there be any virtue, and if there be any praise, think on these things. (Philippians 4:8) Let these things inspire your acting, writing, speaking, whatever you do. Would you say that Handel’s Messiah fits under the heading of Christian aesthetics? I’d say Handel’s Messiah would fit. But why? The Philippians 4 passage is a great place to start. Thanks, Neita. I would rather think of aesthetics as a medium. Is there such a thing as a Christian parakeet? No? I taught mine to say “Praise the Lord” It can preach the Gospel, but it can’t choose its own beliefs. Phil, I’m totally with you on the Christian Parakeet. Aesthetics as a medium…hmmm. I’m thinking about that one. Paint is a medium. Language, stone, the body, sound, metal, music–these are all mediums. It seems to me that aesthetics is a way of describing what’s going on that is different from the media being used. But I’m not sure. I agree that art is mysterious, but there are properties that can be talked about, so that actual judgments can be made. Even if in the end, there erroneous, there is discussion around ideas of quality that we seem to basically agree on. This is where the question of “I like it” is different than “Is it good?” But Virginia Postrel, in her book “The Substance of Style” argues that there may not be much difference in those questions anymore. I’m not sure I agree. So I zapped off a quick response on Facebook- probably bears a little more thought and a little less attitude. But here’s the thing, speaking from current personal and difficult perspective, I’m not sure God cares about the art we make any more than he cares whether a hymn is in C or Bb. Should I use Alizarin Crimson or Vermillion in that landscape? It doesn’t matter. I am moved listening to “Les Miserables” but I don’t think either Victor Hugo or the creators of the hit musical set out to create an aesthetic that had Christ imprinted on it. Christ may be in it but that’s because it’s good, really really good, well crafted and worth investing hours of our attention. But if the novel had never been written and the play had never been created out of it, God would still be God, Jesus His son and the Holy Spirit still able to move in and out of our lives like the wind regardless. That’s why it doesn’t matter. This is an apples and oranges discussion because art and Christianity don’t necessarily rely on one another to happen plus the function of Christianity (and “Christian art” as far as I’m concerned) is socio-political. It has an end-game agenda. Just ask any pastor who wants a skit on Sunday morning. “How can I use this artform to make my point?” is the question they are constantly asking of us. And those of us who “make stuff” do it because it’s there to make and we believe, as Eric Liddle believed God made him fast, we do it because we sense God’s pleasure in it. But Jackson Pollock painted because there was a driving force inside of him fueled by alcohol and probably ADD. Picasso painted for fame. Vermeer for the money. Can I find a “Christian aesthetic” in the plays of Arthur Miller? Sure- because I can assign the virtues of redemption, forgiveness or justice to my belief in Christ. But those virtues don’t belong to Christians, we just think they do when they serve our purpose. Kinkade calls himself the “painter of light.” Since when does he have the corner of the market on the use of light? I find his work to be crap even though, yep, there it is- LIGHT! ooooh, he’s got something there… If that’s a “Christian aesthetic” (and I’ve met people who LOVE Kincade, think he’s the BEST “And did you know he’s a Christian? !”) then I am “Sam Vance, Painter of Darkness.” But it’s CHRISTIAN Darkness. They won’t get it and I won’t try to explain it to them. There is only the work we do. Does God care about it? Maybe. I think He’s probably more interested in what kind of people we are- what kind of husbands, fathers, wives and mothers, sons and daughters etc as spelled out in the Epistles of Paul than he is with our artistic output. We assign WAY too much importance on that- our “calling” if you will. Artists, especially Christian artists put a high priority on their work as though simpy because they can write, sing, act or whatever, then that must be their calling in life and Christian calling no less. That’s pretty arrogant if you ask me. How about just working? What about the artist whose work is not seen or heard, is unsung and off the radar? Does it matter what they are creating or even that they are creating in the first place? Once again, depends on who you ask. What about the artist who is just trying to pay the mortgage, put food on the table, be a good parent and present spouse? If his or her Christian aesthetic comes out of the basic need to eat and provide shelter, does that make the work any less important? Any more? Is it a “Christian” value at all? Or just valuable? We have to be done with the notion of re-assigning values to the work in front of us in order to “Make it Christian.” This justification is self-serving and worse yet, makes Jesus a marketing tool. How embarassing. Our Christian responsibilities are spelled out plainly. Paul’s admonition to “work with our hands and lead a quiet life” sounds like a good formula for the artist, knowing that vocation and avocation sometimes don’t match up-to call upon the overly utlized phrase, “tent-making skills.” This has nothing to do with creating a movement known as “the Christian Aesthetic” just as the Impressionists didn’t set out to call themselves by that name and even kicked the goads about it. If you’re an artist, don’t set out to create Art that is Christian because in reality there is no such thing. Chuck Close says that he doesn’t think about the overall implications of what he’s painting that day… he just shows up and gets to work. Good advice. Awesome stuff. No such thing. Guess I’ll cancel the class. Seriously, great thought here. I do think there’s a discussion to have though, and it’s this: what is it about Christ’s life, death, and resurrection that is operating on you as an artist as you make your own aesthetic, or to put it more simply, as you do your work? Not attitude or moral thought, but the actual aesthetic choices you make? And again, the answer may be none at all, that an artist simply chooses what she chooses because she likes it, she responds to it, it speaks to her…whatever. But when Picasso flattened space in Les Demoiselles d’Avignon and continued to explore the idea in the fuller realizations of Cubism, was it whimsy? Or was there something working in him from the way he saw the world? And how is it that that painting is not just indicative of Picasso’s mindset, but of an entire epoch of painting? See what I’m driving at? The brothel prostitutes had been done before. But not like that. And somehow that aesthetic captured an entire age of art, and a way of seeing the world. I think there may be immeasurable numbers of aesthetic choices driven by Christian warrants, but to say none at all doesn’t seem quite accurate. Well! Very entertaining dialog and thought provoking, as always. I like the comments that have been made already– I once (when young and less restrained) used the very passage Neita quoted in an evening sermon to support my contention that one could not condemn “rock” music from an aesthetic standpoint (not the terminology used, but my point) because Paul never says, for instance. that we should think on “spiritual”things. Why? Because (as I contend) he just defines in a practical, real world sense what IS spiritual thinking. I think the concept is similar. I also really like the comment about graciousness. Whatever our creativity calls us to produce, it should be HONORABLE (see Phil. 4) As you have made a point of focusing on– ” and God said it was GOOD” I don’t think the ” good” was an aesthetic commentary, but more an overall comment– God can ONLY produce what is good, whatever it is. When man produces, it can go bad in many ways. From an aesthetic standpoint, it may not speak to me, but that doesn’t really matter. It could still be excellent from that same standpoint! BUT–If it dishonors God and His ways ( and we dishonor Him when we dishonor others) that is what we should be concerned about. Do we care– not just about quality, but do we care about the bigger questions? I have a magazine article entitled “Does God even like our worship?” Wow. Remember Him blasting the Israelites for how beautiful their music was?? They didn’t care about the right things. And, as I think about your title “A Christian Aesthetic”, I find myself turning it around a bit. If I “be” a Christian, then the term “Christian” becomes the noun instead of the adjective. Similarly the term “Christian Americans “(primarily Americans who happens to be Christian) is not as descriptive of who we truly are as “American Christians” (Christians at the core who happen to be the American variety). My first reaction to the word “aesthetic” is to consider the beauty of a thing, from whatever source that beauty comes. It may br a fine painting, a classic piece of music, or the beauty of assured peace in the face of an old saint who has been witnessing about Jesus all his life and is now close to going home. Of these, which is the most most aesthetic (adj.)? Ron, I like the idea of turning the words around. “Aesthetic Christians.” Or Christians that pay attention to aesthetics. Or–and this is actually what I think I’m after–how about, a Christian’s Aesthetic? Or maybe a simpler question overall: how does an individual’s faith impact his aesthetic choices as both maker of art and receiver of art? And in the end, do aesthetics matter? Aesthetics can refer to the study of the beautiful, but the field also includes the notion of the ugly. In fact, distortion is a strong aesthetic element. Tension and release need each other. beauty cannot exist without ugliness. In fact, creativity requires the possibility of ugliness. Also, the way to truly be ‘made in the image of the Creator’, is to create. 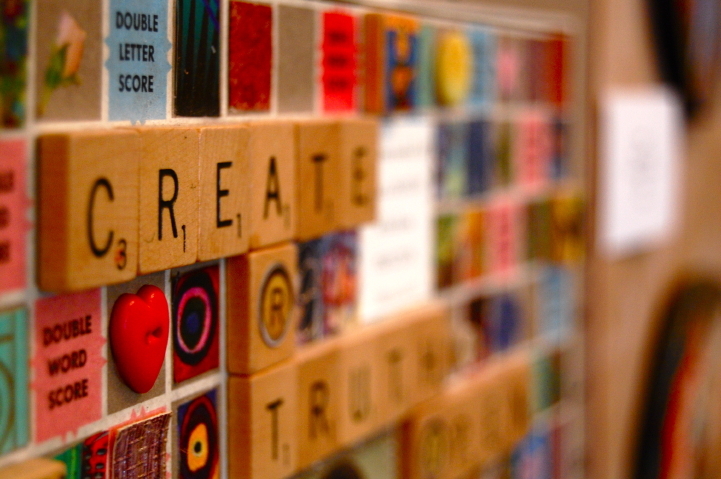 To not create is to deny your own humanity, and the Image to which you were created after. Christian aesthetics. It is what it is. One pastor deems it wrong, the next deems it the perfect paradigm. Those are man-made views, and not wholly Christian. So, maybe, it’s just the clean vs. unclean, or rather everything inside the big blanket is deemed okay by God, while we sit around and play artistic games with ourselves trying to be more artistically Christian than the next guy. Creativity is the realm in which God has worked here on Earth, and continues to work. As He is creative, so are we. So we need to create, Whether or not it is palatable to anyone else is irrelevant. Christian aesthetics for Christian aesthetic’s sake? Do all in the name of the Lord, and to the glory of God. 1. the branch of philosophy dealing with such notions as the beautiful, the ugly, the sublime, the comic, etc., as applicable to the fine arts, with a view to establishing the meaning and validity of critical judgments concerning works of art, and the principles underlying or justifying such judgments. 2. the study of the mind and emotions in relation to the sense of beauty. Since Yeshua is the source and sustainer of what is good, what is true, what is lovely, and what is of enduring significance, He is actively engaged with aesthetics. But aesthetics encompasses more than what is beautiful or excellent. One can create beautifully proportioned or beautifully portrayed people or objects that are static and vacuous. To me, truth and love generate beauty. Consider the depth of character carved into a really old face, or new life arising from dessicated or ruined places: they are not ‘lovely,’ but they are beautiful. As a child of the Holocaust, a survivor of severe abuse and a Christian minister, i have needed to deal with spiritual darkness. It does need to be exposed, yet in a way that begins and ends with hope and truth; that is, Yeshua’s triumph over darkness in this world. A grim, dissonant work of art can be very aesthetic. Since aesthetics has eternal, spiritual aspects in the LORD Himself, and aspects embedded in the creation by the Creator (proportion, color wheels, etc. ), as well as human socio-cultural, emotional and sensory aspects – the subject seems inexhaustible, yet has a reality beyond our difference views. Next PostNext Does Art Matter?